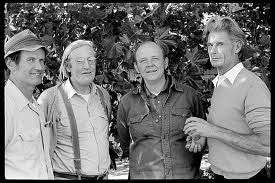 Pictured are Richard Wilson, Page Smith, Paul Lee, and Alan Chadwick. Click the image for the photo credit. This picture was taken in 1973, in Covelo, California, probably on the property of Richard Wilson. 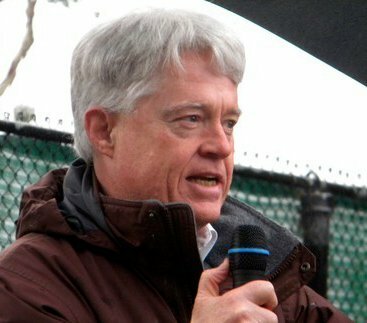 Richard Wilson headed the California Department of Forestry and Fire Protection under Governor Pete Wilson (no relation), and is well known throughout the state. For Santa Cruz residents, though, Wilson is the outlier. Chadwick started the famous "Chadwick Garden" at the University of California at Santa Cruz, and was well known in the local community. Page Smith, eminent historian of the American Revolution, was the first Provost of Cowell College, and Paul Lee was a professor (for a time) at Crown College. Lee and Smith both campaigned for the establishment of the garden and supported Chadwick's (often controversial) efforts. It was Page Smith who said that "Alan Chadwick’s garden is a ‘garden of the mind’ as much as it is of the soil, and like all genuinely inspired creations it has the power to stir us to new dreams, to a new vision of what man and nature can do, together." Paul Lee has written a book about his experiences with Alan Chadwick (among other things). The book is called There Is A Garden In the Mind. I recommend it for those who want to remind themselves of the vitality of politics and community life in Santa Cruz during the 1970's, and during the early years of UCSC, and for those interested in some fairly arcane researches into philosophy and religion. I particularly appreciated Lee's exploration of the tension between "vitalism" and "physicalism," and how he ties his exploration of those conflicting approaches to the world to the garden project of Alan Chadwick. I also appreciated his observation, found throughout the book, that the industrial world we inhabit is a "world above the given world of nature." This is a phrase that Lee attributes to his teacher Paul Tillich. It is another expression of the "Two World Hypothesis" that I have come to think of as a kind of key to finding how we can, as Page Smith hopes, realize a new "vision of what man and nature can do, together."